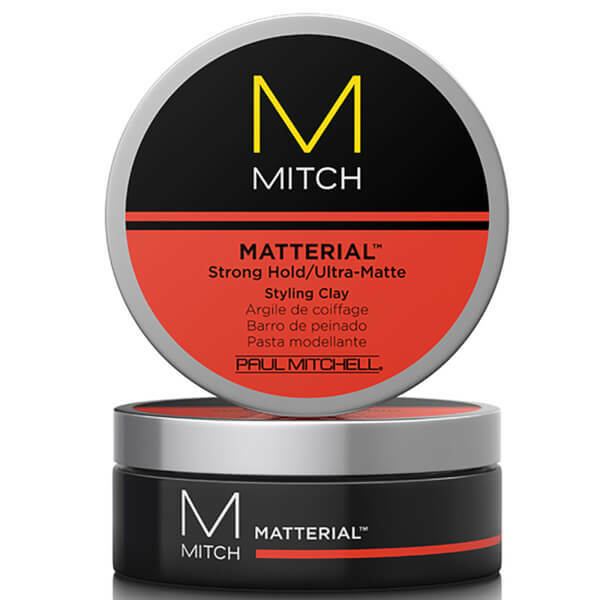 Delivering superior control, the MITCH Matterial™ Ultra-Matte Styling Clay from Paul Mitchell can be applied to damp or dry hair for ultimate texture and definition. Powered by thickening ingredients and strong fixatives for added volume, the lightweight clay creates a fuller-looking head of hair, whilst delivering a long-lasting matte finish and allowing you to achieve your desired style without messy build-up. Aqua (Water, Eau), Cera Alba (Beeswax, Cire d’Abeille), Ozokerite, Diethylhexyl Maleate, Glyceryl Stearate, PEG-100 Stearate, Propylene Glycol, PVP, Cetearyl Alcohol, Methyl Glucose Sesquistearate, Isostearyl Alcohol, Ceteareth-20, Aminomethyl Propanol, Acrylates/C10-30 Alkyl Acrylate Crosspolymer, Kaolin, Butylene Glycol, DMDM Hydantoin, Sorbic Acid, Iodopropynyl Butylcarbamate, Parfum (Fragrance), Limonene, Hexyl Cinnamal, Coumarin, Linalool.